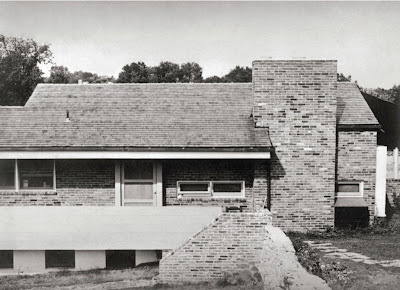 Following is a blog post from the course "Mid-Century Modern Architecture in St. Louis" at the Sam Fox School for Design and Visual Arts taught by Andrew Raimist and John Guenther. The following entry was composed by Andrew Raimist. Today our class visited two houses designed by Isadore Shank: the Shank House and the Zerman House. 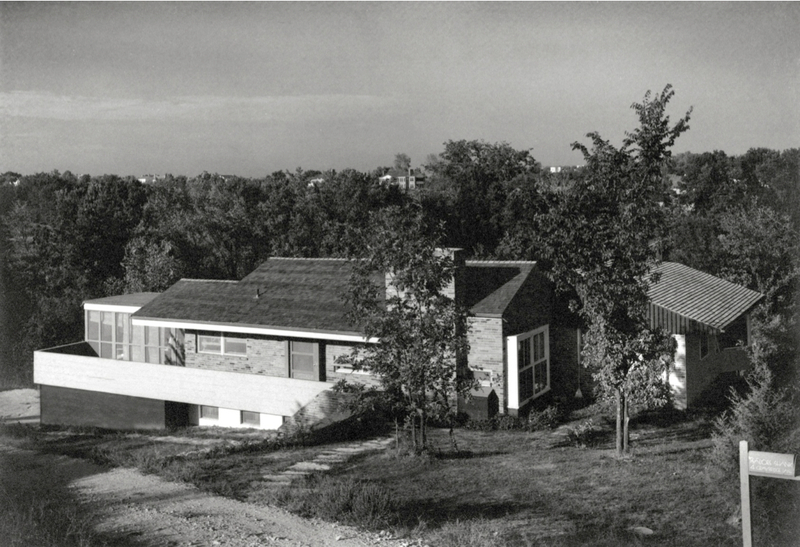 The Shank House was designed and built around 1940, while the Zerman House was from 1958. While both houses are clearly "modern" there is a great distance between them intellectually and philosophically. Isadore Shank, Shank House, circa 1940. The focus in the Shank House seems to be more on the planes and material textures than on the volumes. The design of different surfaces with contrasting materials or textures tends to break down our reading of the volume as a consistent piece of three-dimensional geometry and forces the viewer to pay more attention to the separate surface textures, colors and surfaces in trying to understand the architect's intentions. The Zerman House seems much more easily legible and readable in the sense that whether you look at the house from the street, from the side, rear or interior, it's organization and structure are clearly evident. There is a similar interest in using contrasting planes and materials, but the palette used is more limited and more "logical" in the sense that brick masonry suggests mass, solidity and privacy and it performs in that way. Similarly, the glazing is used in a way that offers clarity of vision and structure, allowing us to see the actual wood framing of the house which extends from inside to outside. In this way, the house has a greater sense of transparency and honesty of expression than the Shank House. 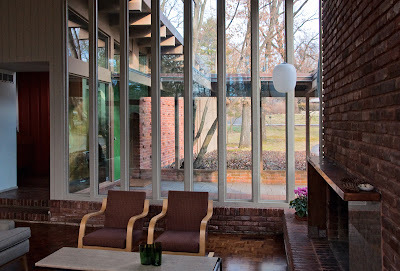 Isadore Shank, Zerman House: view from Family Room toward Entry. Photograph by Andrew Raimist. One of Shank's preoccupations seems to be with issues of privacy. It appears in many of his designs through the use of screen walls and layered compositions that don't reveal the entirety of the structure from an initial glance. The sense of protection seems to be of special importance with respect to the relationship between the street and the house interior. The Shank House is more closed and disarming to the visitor, while the Zerman House offers a clear sense of entry and arrival and welcome with the covered walk and extensive glazing adjacent to the main entry which allows visitors to see into the main public space of the house. If a party were going on in the house at nighttime, that would be evident to anyone driving by, while I'm not sure that would be so clear for visitors to the Shank House (unless the party spilled out onto the porch). Isadore Shank, Shank House, facade, circa 1940. The front/side porch is an unusual feature of the Shank House. It functions in a way like historical porches on the fronts of many American homes where occupants could sit outside to enjoy good weather and be available to passersby. There's a sense of this kind of "display" and sense of public space in the way the porch is clearly visible from the street and to visitors arriving at the house. From the viewpoint of the house itself, I imagine it functioned very much like an American "back porch" where friends and family would gather for meals and conversation. Since the street is a cul-de-sac and basically private, there was never a great deal of traffic going by. The result was that the family could count on a reliable sense of privacy even when outside on their front porch. It is tempting to view this sense of openness in relation to Shank's political interests in communism as a form of social organization. 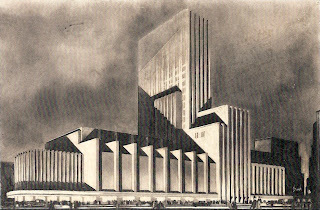 In the prewar years in the Soviet Union (prior to Stalin), there seemed to have been a clear sense of revolutionary spirit which extended from political sensibilities to an acceptance and desire for new forms of architecture which would embrace and embody these beliefs. Clearly Shank had particular views on the relationships between individuals and how they might more properly relate and cooperate with one another. The discrimination he faced being a Jew in a relatively tight-knit, conservative St. Louis community likely caused him frustration at the way that people would hire one another based upon irrelevant factors rather than based upon skills, experience and ability. Aleksandr Z. Grinberg. 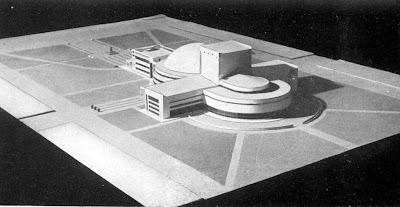 The House of Culture and Science in Novosibirsk, Russia, 1931. From "Perception and Critique of the Architecture of Novosibirsk, 1920-1940." So the question arises whether I'm projecting my own peccadilloes onto Shank or whether there is a legitimate connection between his political beliefs and how they might have influenced or effected his conceptions of architecture. When viewed through the widest lens, it seems almost ludicrous to try to conflate politics and architectural form, however ultimately the architect has to have some preconceptions about the way people could or should behave toward one another. Architecture functions as the framework within which such relationships and interactions take place. In making the decisions about where to place a wall and how to create openings in them, there are assumptions that an architect makes with respect to how those separated spaces will allow for interaction or provide for privacy. While people may disregard or actively seek to undermine the constraints that architecture puts in their way, there are nevertheless many assumptions that an architect makes in deciding how to configure a plan. This is particularly true in the case of a residence where the architect knows something of the personalities and peculiarities of the owners. Many such factors are likely lost to history in being contained only in the conversations and memories of the individuals involved. Drawing specific conclusions with regard to particular clients is bound to be filled with hypotheticals and assumptions. In the unique case where an architect designs a home for himself and his family, there is a presumption that there is a greater freedom to design the structure the way he or she envisions to be correct or ideal. Of course what constitutes the ideal at a given time will be subject to change as time passes and experiences accumulate. An architect may well be his own harshest critic with the punishment being forced to live with his own decisions (or "mistakes"). 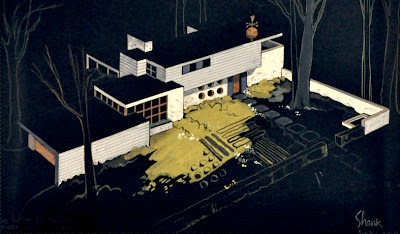 Isadore Shank, Shank House proposal (unbuilt), circa 1940. For Isadore Shank, having built and lived in one home throughout his life, we don't have the ability to speculate meaningfully about what he might have designed for himself in the 1950s or 1960s. One can only look at the examples of the work produced, compare and contrast them, and extrapolate from their differences the development of an architects ideas and beliefs as they change over time. It seems clear that Shank faced a great deal of disappointment, particularly in the earlier years of his career, when he proposed some monumental structures and devised inventive, experimental architectural forms. The lessons of the American capitalist system can be harsh and difficult to accept, especially for a visionary with strong beliefs and demonstrated capabilities. The realities of real estate development, contractual obligations and legal structures can undermine an architect's ability to carry out his vision and see it implemented. It seems that Shank faced some of these kinds of challenges and developed his own approach to dealing with the inequities inherent in the real, flawed world in which we live. 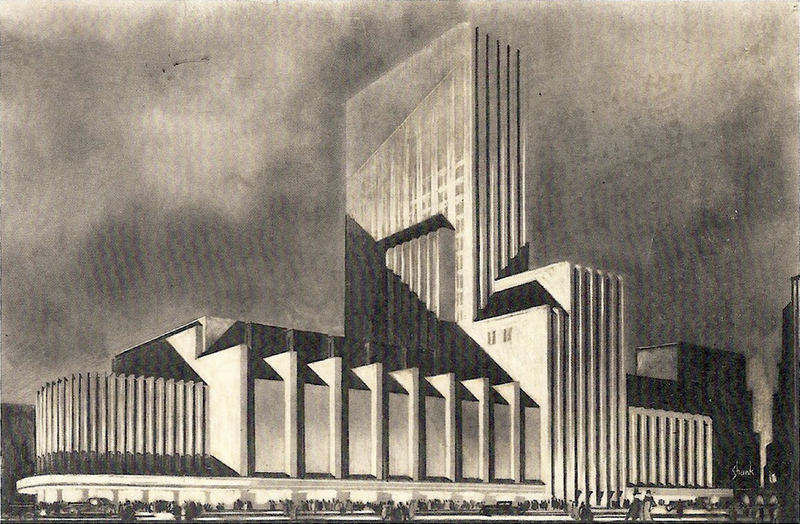 Isadore Shank, Ambassador Theater proposal, circa 1928. In the postwar period, Shank seems to have found an approach and a strategy for working for people with whom he found a basis for common understanding. Of course, all architects and designers must find clients with whom they have a sufficient beliefs in common to establish a meaningful, productive working relationship. In Shank's case it seems that his aesthetic conceptions and his ethical beliefs were tightly knit in a way that he had to be careful and considerate to take on the kinds of project that would provide a reliable basis for his professional practice, offer a sense of personal gratification and continue his quest for creating a better world. The house was a mix of traditional, yet modern design. Awesome architecture! It’s relatively well established.